Basically Joy: August Goals: Accountability Starts Now! 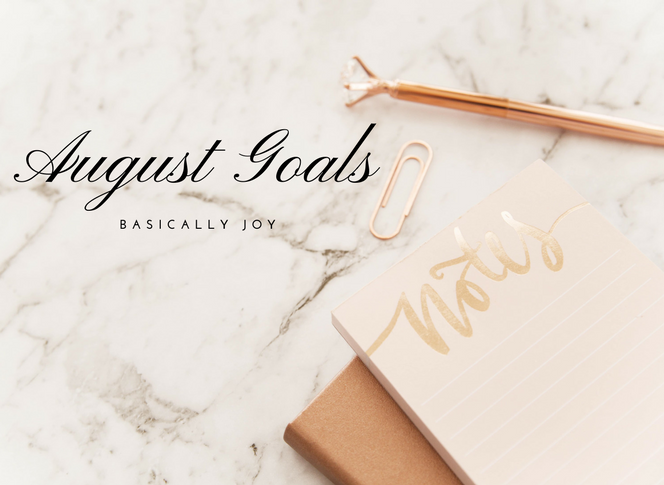 I know we are already a week into August but I see so many other bloggers post about their goals for the month, not only blog related but personal too! I love the idea behind it because it really focuses what needs to happen. I'm a very task and goal-oriented person so I think this is going to be quite helpful for me! 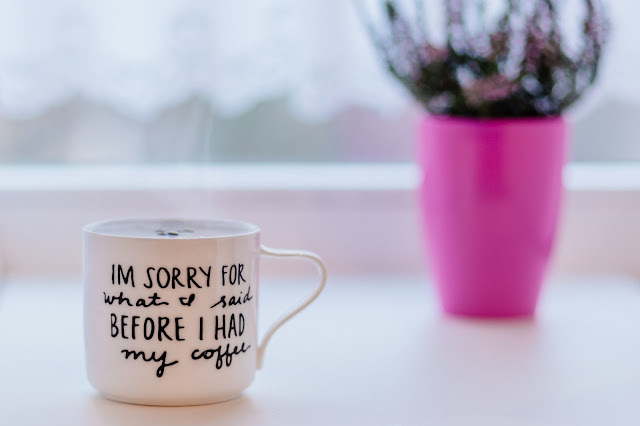 I could always use more accountability in my life so here I am, jumping on that blogger bandwagon! I think my goal for my goals (haha) will be to have 3 goals each related to blog and my personal life. 1) Put myself/blog out there more. I really want to up my game and get involved more with other bloggers and my readers. I teamed up with 2 of my blogger IRL gal pals (Sassy Southern Lindsey and The Cocooners) to do a giveaway (check back Thursday for the details), which is something I've never done before. I wanted to do this to really get my blog some visibility it hasn't had before and, quite frankly, I'm a little scared of! I also want to get involved with at least 1 campaign this month. I've been leary to do so because I really want to do brands that partner with me proud which means incorporating more time to commit to posts. I am ready to knock this one out of the park! 2) Consistently post twice per week. I'm sure this seems small to the majority of bloggers but I have to start somewhere. With as much as I work, planning content and getting photos for that content is time consuming so I need to get better with planning ahead to take away the "crunch time" feeling. 3) Increase my social media following. Instagram is now a full on influencer hater, which makes this a tad difficult, however I am still going for it! I am aiming to grow my IG to 1200, roughly at 1100 right now. We will see how this goes over the month - fingers crossed! 1) Lose 300 pounds. Okay, fine, 10 pounds. I am starting at Orange Theory Fitness this week because I have heard so many good things about it! I know you are supposed to have self-love for your body but blugh! Maybe I can expand on that in a blog post in the future. 2) Carve out 1 hour 5 days per week to spend reading. I don't even care what I read, I just need to have a daily soul detox from social media and television. I almost always have the T.V. on for background noise when I am doing anything around the house i.e. laundry, cleaning, blogging. This will be my time to unwind and unplug! 3) Bring my lunch to work 3x per week, minimum. I am the WORST at planning out lunches. It doesn't help that we have a gourmet kitchen in our building that always has amazing, healthy meals! When I sit down and think about it, I really cringe at how much I spend in a typical work week especially when I add in Starbucks. Yeah, that's right, there is a Starbucks in my building. Bring on the self-control! With that being said, I'm going to tack on limiting Starbucks to once a week i.e. drinking my coffee at home. I feel like I just need to mark this as a loss already, haha, but I will hold out hope nonetheless! There they are, for the world to see. Is it bad that as I look at them I'm hoping to hit 4/6 goals? I mean that's reasonable, right? A goal for hitting my goals. Yeah, that's micromanaging at its finest right there folks. I think this will help me further my goals on my dream board as well. If you don't have a dream board, I cannot recommend it enough!! Do you have goals for the month? For the year? How do you keep yourself accountable? Can't wait to see how everything goes throughout the month and I'll check in with new goals next month! I love that you're sharing your goals with everyone for August! I always find it keeps me super accountable when I share them with my readers :) These are all great goals! I need to work on getting my workouts in more to, let me know how you like Orange Theory Fitness!! Good luck on your goals! I have also heard great things about Orange Theory! I used to be an Orangetheory member and loved it! I only put it on hold for a while. I had good results. Enjoy! Ps- I love your mug! Totally get the whole bring your lunch to work thing! It's literally so hard! Great goals for this month!! Putting yourself out there as a blogger is always nerve wrecking but so worth it. I used to be scared if I put my blog out there that it may mean others being negative towards me,etc. Now I'm like not everyone is going to like my blog,etc but those who do make it that much better. So go for it!!! Girl, you can totally knock it all out-of-the-park!